I received this delicious recipe from a friend. These waffles are light, fluffy and perfect for brunch! This waffle recipe comes in an easy to print format so that you can save it for your next Sunday brunch. With the right toppings (think chocolate syrup, whipped cream and sprinkles), these would even be a great dessert! Delicious waffles that are easy to make! You can make this mix the night before and store it in the fridge overnight. In a large bowl, stir the flour, baking powder, sugar and salt together. Add in the egg and stir well. Add in the oil and stir well. Add in milk to the desired consistency (thicker is better for waffles). Pour into hot waffle iron and cook until lightly browned. Sliced fruit, syrup and whipped cream are all delicious toppings for waffles. Waffles can be a meal on their own or you could add in some side dishes like hash browns or turkey breakfast sausages. Waffles are my favorite food to serve for brunch when we have company. To add a little extra flavor to this waffle recipe, you could also add in some blueberries, chocolate chips or cinnamon into the batter before pouring into the waffle iron. For more delicious recipes, check out our special Recipes page. We have loads of recipes that are perfect for parties and entertaining. Have you joined our communities yet on Pinterest, Facebook and Twitter? We’re growing daily and we’d love to welcome you to the community! Join in the conversations and share your ideas – we’d love to hear them! Oh this looks delicious. 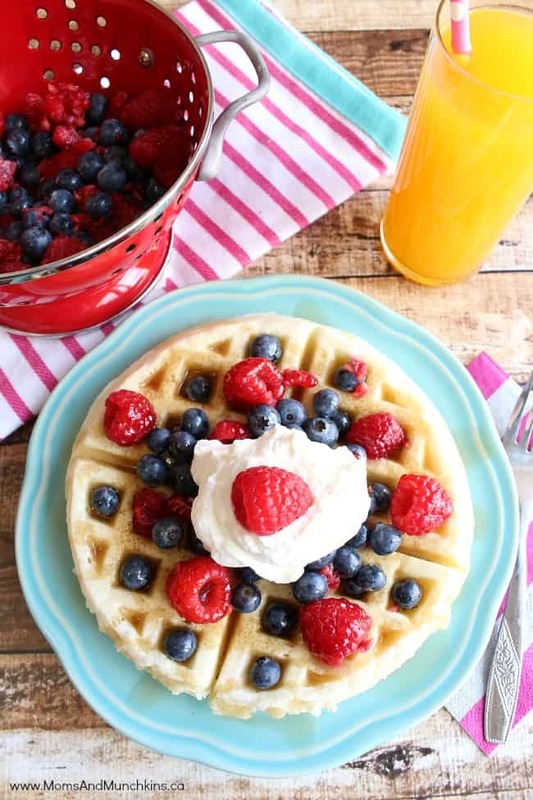 I love making homemade waffles and love them with berries on them, thanks for sharing!! Mmmmm, I love waffles and these sound great. Ohhhh! I love this!!! Thanks so much for sharing! A good waffle recipe is a good thing to have! We used to make waffles all the time, and then we got out of making them. We really must try to get back into making waffles – these look delish! We love waffles! Thanks for linking up with What’s Cookin’ Wednesday!